The Satellite programme of contemporary art exhibitions was started by the Jeu de Paume in 2007. Each programme is conceived by a curator of international renown (Fabienne Fulchéri, María Inés Rodríguez, Elena Filipovic, Raimundas Malašauskas, Filipa Oliveira, Mathieu Copeland, Nataša Petrešin-Bachelez and Erin Gleeson). Since 2015, this programme of exhibitions has been organized jointly by the Jeu de Paume and the CAPC musée d’art contemporain de Bordeaux. The ninth series, titled “Our Ocean, Your Horizon” and curated by Heidi Ballet, investigates the concept of oceanic identity – a sense of belonging that is shaped by an outward-looking prism and focuses on horizons and what lies behind them – in contrast to land-based identity, which hinges on the demarcation of finite space. In response to this proposal, Edgardo Aragón engages with critical cartography, Guan Xiao examines transformation and travel, Patrick Bernier & Olive Martin address the consequences of historical sea travel and Basim Magdy evokes untold stories of the sea. In the video installation I Belong to the Ship, Patrick Bernier & Olive Martin offer the visitor two total-immersion experiences. The first is a meditational experience inside the Abolition of Slavery Memorial in Nantes, a place of memory dear to the artists, designed in the form of a ship’s hull stranded on the edge of the river Loire. In the second, the spectator watches European cruise passengers being served by the international crew of a cruise ship in the Mediterranean. Life on board is accompanied by low background music, a promise of some unknown, sweet but inevitable destination ahead. Navigating their way through the permeable, adjoining spaces of the Maison d’Art Bernard Anthonioz, the artists confront us with deep-rooted antagonisms and the contemporary resonances of colonial history. This book traces the genesis of this work through an interview with the artists by Heidi Ballet. Resonating with Bernier & Martin’s project, a text by Kossi Efoui invites us to discover a little-known, half-forgotten monument in Nantes: the statue of Henry the Navigator, which has stood in the town since 1986. 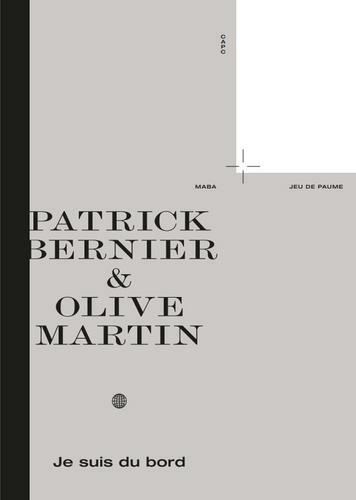 Patrick Bernier & Olive Martin have worked together since 1999, experimenting with forms as varied as films, performances, photographs and sound pieces, on a number of different projects, often in collaboration with professionals from other fields: lawyers (Sébastien Canevet and Sylvia Preuss-Laussinotte for X and Y vs. France: The Case for a Legal Precedent, Aubervilliers, 2007); storytellers (Carlos Ouedraougo for Quelques K de mémoire vive, 2003–2005, and Myriame El Yamani for Bienvenue chez nous, Residency album, Montreal, 2005); and an auctioneer (Steve Bowerman for Traceroute Chant, San Francisco–Paris, 2010). What they create are “monsters”, works where, through imprecision, hesitations and surprises, we become aware of the stratagems people willingly adopt to subvert their own language and form. This questioning of the individual’s relationship to a territory of their own, a country, region or professional activity, is also the focus of their two films, Manmuswak (2005) and La Nouvelle Kahnawake (2010). In 2012, they created L’Échiqueté [“Chequered Chess”], a variant on the game of chess, which highlights the paradoxical situation of the half-caste in colonial history, as well as the ambiguous situation of the politically committed artist in the field of contemporary art. Heidi Ballet is an independent curator and researcher from Belgium who is based in Berlin. She is currently preparing a large group exhibition that will open at CAC Vilnius in September 2016. Since 2012 she has been working as a research curator at Haus der Kulturen der Welt in Berlin for the 2013 exhibition “After Year Zero”, a travelling exhibition that moved to the Museum for Modern Art, Warsaw, in 2015. Other recent exhibitions include the 2015 edition of Brussels Cologne Contemporaries and the group exhibition “Let the Body be Electric, Let There be Whistleblowers” (co-curated with Anselm Franke) at Dan Gunn gallery in Berlin in 2014. Heidi Ballet was the assistant curator of the 2012 Taipei Biennial “Modern Monsters/Death and Life of Fiction”. From 2008 to 2012 she was director of the Jan Mot gallery in Brussels, where she curated the group exhibition “The Encounter” in 2011. In 2014 she participated in the Fondation d’Entreprise Ricard Young Curators Invitational and the Berlin Biennial Young Curators Workshop.